Sometimes we set goals well in advance. We plan for months, or even years. We carefully consider all the requirements to be successful; equipment, training, travel, and support. Sometimes a goal jumps up and bites us. Yesterday, I was bit. I’ve spent the better part of that past two weeks on the road. I visited with family, spent time with friends, and worked the RnR VA Beach event. 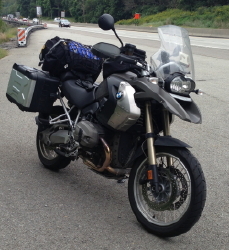 Everything I needed for all of that was packed on a BMW R1200GS. It was my transportation, my office, and my companion. 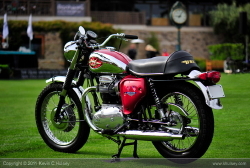 You don’t have to know much about me to know that motorcycling has been a life-long passion. From the time I rode a Sears Moped, at 11 or 12 years old, I have been in love with the magic and the motion of motorcycles. The fact that the “older boy neighbor” across the street had a BSA Lighting and wore a leather jacket just made the desire to ride even stronger. I suppose the “penguin” philosophy started with motorcycling. I didn’t care how far I rode. I didn’t care how fast. And I never cared very much what I was riding. I liked riding big bikes and small bikes. I liked riding on the street and off-road. If it had a motor and two wheels [sometimes three] I wanted to be on it. But it was being “on the road” that always had the greatest appeal. Maybe it’s just wanderlust, or an insatiable curiosity, I don’t know. What I know is that traveling the highways is where I felt most at home. A big day for me would be 300 miles or so. That’s about 8 hours in the saddle and that seems about right. Twice in my life, once when Jenny and I did the 1000 miles in 24 hours “Saddle Sore” challenge, and once when my old riding and Army buddy Larry and I decided to ride from Arlington to Chicago, I’ve ridden over 700 miles in a day. Yesterday’s ride was just a little over 700 miles. And, it was the longest solo day I’ve ever ridden. I didn’t plan to ride that far, it just happened. They day was nearly perfect, the traffic w as light, the bike was running well, and I was feeling good. The miles kept adding up. I’d get gas, ride a 125 miles or so, get gas, and do it again. Before I knew it, I was almost to Indiana. At that point, stopping wasn’t an option. So often, as a runner, I limited myself to what I thought I could do. When I thought that a 5K was a far as I could run I ran a lot of 5K’s. Then it was 10K’s. The half marathons. The fulls. At each new distance I defined the limit of far it was that I could go. I look back now I think how wrong I was. I look ahead and wonder whether I am still setting limits based on imaginary limitations. To paraphrase Satchel Paige, I wonder how far I could go if I didn’t know how far it was. It may be too early to start setting goals for 2014, but I’m beginning to think I’m going to have to find out how far too far really is. Great post. A motorcycle and wanderlust really make great companions.